Boats like the Crystal Sea III are being presented to the public as industrial fishers. Small-scale fishery has a good image within the European public opinion. 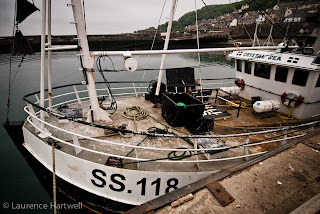 By favourishing the creation of future sustainable fisheries trust based only on the very small small-scale fishery, we consider there is an attempt of self appropriation of this good image and its strong value in terms of communication and sympathy. This also automatically classifies the other intermediate small-scale fishermen as ‘industrial’ in the public opinion. Intermediate small-scale fishery is also a strong source of employment, value and volume for the European small-scales fisheries. This part of the industry is also quite weak in front of systematic implementation of the privatization of the fishing resources. This intermediate small-scale fishery is mainly based on over 12 m vessels, targeted by the proposition of privatization of the European fishing resources. Which impacts can we foreseen? This intermediate part of the small-scale fishing industry trades its catches through fish-auctions thanks to a diversified network of first buyers, from small scale retailers to bigger fish-merchants, including intermediate fishmongers. These interactions between these fishing fleets and their buyers are the core part of social and economical contribution of the current European coastal fishing communities. By putting pressure on this intermediate sector through privatization of the fishing rights and eviction from important fishing grounds, it decreases its size. Its catches will decrease in same proportion. This loss will impact the first-trade through fish-auctions and the existing intermediate trading industry which will have no more reasons to exist. Remaining very small fishermen will warranty a resource they will trade through short-distance trading scheme, highly lucrative, targeting restaurant and economically gifted consumers. The possible disappearance of this intermediate will emphasize the split between very small fishermen and a more off-shored industry, then qualified as ‘industrial’. This ‘industrial’ fishery will be confined in smaller fishing areas, even for off-shore areas. Market will be mainly supplied by the ‘industrial’ fishing fleets and imports. Nowadays, big retailing firms play a strong role in trading seafood. They request a standardized products, and for fishery seafood products, mainly a narrow range of whitefish. Trading needs of this outlet are based upon standardized products and yearly contracts. In this type of contracting issue, one fishing mode is bound to win: mono species fishing, for which the fisherman nearly knows what he is going to catch before leaving the port. On the whitefish market, main imports come today from Norway and Iceland which have mono species fisheries, nearly all at the maximum production yield. In this type of trading, European off-shore fishing industries face an handicap because of their multi species status : they catch several species in the same hawl. They still need a network of fish-auctions and fish merchants to sell the complexity of their catches and to survive. This network is the same as the one used by the intermediate small-scale fishery. If this network disappears, European new industrial fishing industry will probably face difficulties to sell their catches compared to Iceland and Norway imports. This scheme of only favorishing very small small-scales fishery may strongly impact economical condition of the other European fishing industries. We might expect a strong decrease of the size of the Industry, amplified by the implementation of large strict area-based management, if no-fishing zones. The fishery industry will thus ‘free’ new marine spaces. Regarding short-distance trading schemes, these are a good opportunity to develop fairer relationships between fishermen and their coastal community. In some areas they are essential, especially when there is no fish-auction. In some others they are a good complement to existing trading schemes. But in any case, they would give way entirely to existing fish-auction schemes and to the highly varied parts of richly diversified small scale fisheries.